This page describes how to create a Chess set from a piecepack and 88 cents worth of U.S. currency. If you don't have U.S. currency because you are not in the U.S., you will have to improvise with the local currency. If you don't have a piecepack, well, I feel sorry for you. Make a Chess board by creating a 4x4 grid of piecepack tiles, grid-side-up. Give each player two null coins, two ace coins, and two 2 coins. The null coins will become the Rooks (mnemonic: a blank coin looks like a castle tower seen from above). The ace coins will become the Bishops (mnemonic: the spiral looks like the top of a bishop's crook). The "two" coins will become the Knights (mnemonic: a "2" looks like a Chess Knight). How will the players tell their Rooks, Bishops, and Knights from those of their opponents? As in Shogi (Japanese Chess): by the direction they are facing. The pips on the coins show which way they are attacking. If the pip on a coin is facing your opponent, it is attacking him, therefore it is your piece. The reverse also holds. From the remaining coins, one player takes an Arms and a Crown coin, and the other player takes a Sun and a Moon coin. The player with the Arms and Crown coins is called the Royal player. The Arms coin is her Queen, and the Crown coin is her King. The player with the Moon and Sun coins is called the Astronomical player. The Moon coin is his Queen, and the Sun coin is his King. If you don't have eight pennies and eight dimes, improvise. You can use eight pennies and eight nickels, for 48 cents worth of change. 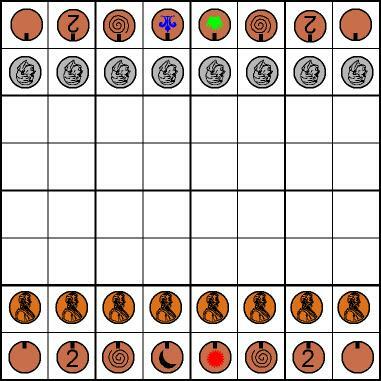 You can even use 16 pennies, if you turn one player's Pawns heads-up and the other player's Pawns tails-up. In Chess, the White player goes first. I suggest that one player hide a Crown and a Sun coin, representing the Kings of the two sides, in her fists, and the other player pick a fist. The side whose King is chosen is considered to be White for the current game.